I meet people all the time who tell me how impressed they are by the good that we’re up to in the city.My experience, however, is often quite different. When I go around the city, I often ended up being impressed by the good that other people are up to. A couple months ago, a group of us went around the Washington Heights neighborhood (a poor neighborhood in Haverhill), handing out free cookies and asking people what would make their neighborhood a better place. As I was walking with another couple people, I saw a group of kids playing behind an abandoned church building in the back of a parking lot. “Yeah, we want to make our neighborhood better,” one of them responded, with the type of earnestness possessed only by nine year old children. He pointed up to the tree they had been climbing when we walked to the back of the parking lot. “Yeah, we want to clean up this parking lot”, he said, pointing to a pile of trash, “and put up a tree fort and put up a gate there”, and, pointing to another part of the parking lot, “a basketball hoop there, so people can come and play”. “We even have a dog guard!” another child piped in, pointing to a small dog leashed up nearby, who barked enthusiastically, as if on cue. “That’s great.” I said, as I offered one of the other kids a second bag of cookies for his little brother and took a picture of the three of them, poised proudly around their tree-fort-in-construction. I was reminded, in that moment, how very-not-alone I was in my quest to make this city a better place. 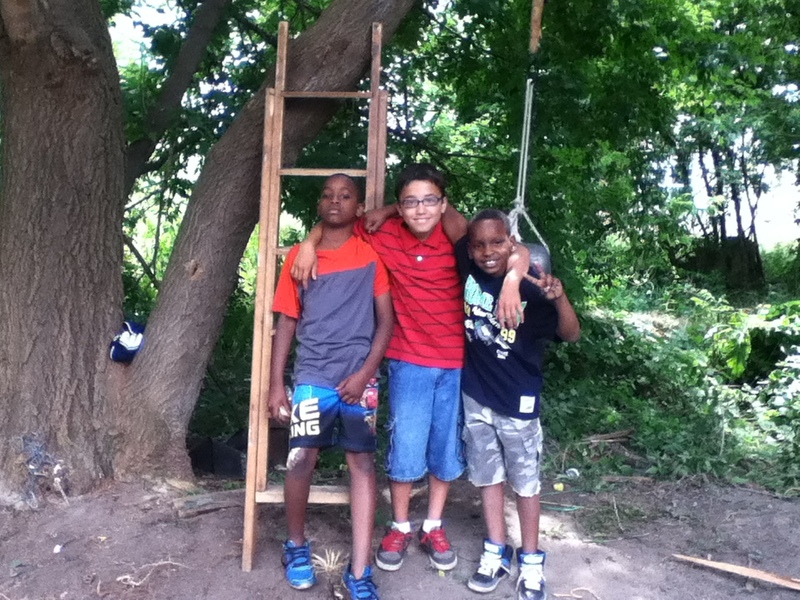 Here were these kids, alone on a Sunday afternoon, living in one of the very worst neighborhoods in my city, who, without any prompting, wanted to love their community. I shouldn’t be amazed by this by now. I often think that I am bringing light to dark places – to places where people have lost all hope, lost the ability to change their lives for the better, have lost the ability to care for themselves or for those around them. But, as I think anyone who works in neighborhoods like this will tell you, it is not that we are bringing light to dark places, it is that we are discovering the light that is already there. It is already flickering in the forgotten corners of our cities, in the hearts and lives of single moms bravely raising kids on their own, in recovering addicts who are trying to put their lives together when it seems like everything (and everyone) is against them, and in nine year old boys who are foolish enough to believe that they can make a little place where all their friends can come and play. These neighborhoods don’t need me. They don’t need my light.They just need to learn that what they already have, and that the goodness already inside of them is capable of making a true difference in their community. And do-gooders, like myself, have to remember to get out of the way and let their light shine.